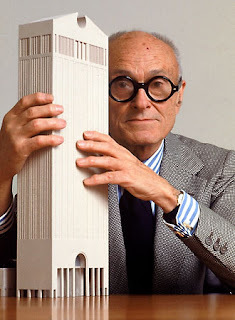 Philip Johnson (1906-2005) was one of the twentieth century’s most influential architects. His career spanned more than seventy five years. When Cleveland-born Johnson died just shy of his 99th birthday, he was survived by his partner of 45 years, David Whitney, who died six months later. Whitney, 33 years younger than Johnson, was an art collector and curator who had been a friend and confidant of Andy Warhol. Johnson did not officially come out publicly until 1994, when his biography by Franz Schulze was released. Johnson designed a new sanctuary and chapel for Dallas's Cathedral of Hope, at 4,000 members the nation's largest gay and lesbian religious congregation. The chapel was dedicated in 2010, but the 2,000 seat main sanctuary remains unbuilt because of a lack of funds. The design has no parallel lines; the walls twist, tilt, and bend into ceilings and floors. Monumental, unconventional, and ever-changing, the proposed building will be a symbol of strength, hope, and unity. It will minister to society's need for the wisdom to perceive that homosexuals are integral to society, not alien from it. The Cathedral of Hope complex was Johnson's last project before his death in 2005. While in his twenties Johnson visited landmark architectural sites and structures in Europe. 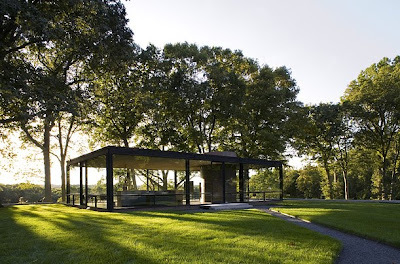 It was a meeting with Bauhaus architect Mies van der Rohe that changed his life. The two became instant collaborators and competitors. They also incurred the pique and envy of Frank Lloyd Wright, who rejected their stripped down International Style, pared of ornament. 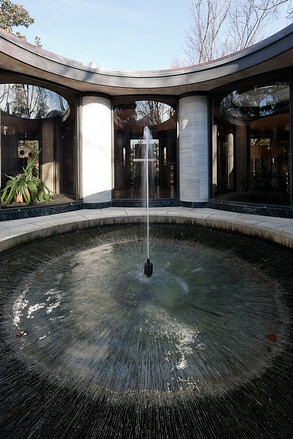 In 1949, after service in the U.S. Army, Johnson created his masterpiece, the "Glass House" in New Canaan, Connecticut, a profoundly influential work (above). The all glass house set in a landscape with views as its real walls served as his own residence. The building is an important achievement in minimalism, geometry, proportion, and the effects of transparency and reflection. Johnson went on to design important buildings in NYC, particularly the Seagram Building (1956) on Park Avenue and the coordination of the overall plan of Lincoln Center (1960s). The AT&T Building (now the Sony Building) in Manhattan (1984) set the world of architecture on its ear by introducing a new style known as post modernism. That building boasts a Chippendale pediment, as if it were a highboy or wardrobe, instead of an office building (photo at top of post shows Johnson holding the model). I am lucky to live within a few miles of one of Johnson’s quirkier buildings, the Pre-Columbian Pavilion at Dumbarton Oaks (Washington DC), a little-known architectural masterpiece. Completed in 1963, it is part of an estate property best known for its gardens designed by Edith Wharton's niece, Beatrix Farrand. Now owned by Harvard University, the museum was originally the home of philanthropists Mildred and Robert Woods Bliss, who filled it with their extensive collection of rare books and Meso-american art. The pavilion, a perfect square which consists of a series of eight undulating glass circular galleries with domed ceilings (each 25 feet in diameter), wide marble-clad columns and a central, elegant open-air fountain, perhaps outshines the objects it displays. 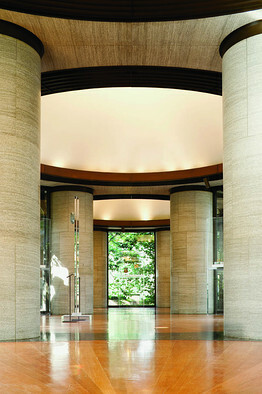 Curved walls of glass integrate the building into the garden setting, and teak floors are laid in radiating patterns in alignment with the domes.Think of it as the way a set of dice indicates "nine," a grid of three rows set in three columns, with the middle dot missing (that's the open air fountain, below). The noble beauty of the small structure in this intimate setting proves that Johnson could deliver a significant intimate structure other than his famed 1949 Glass House in New Canaan, Connecticut. Johnson said his inspiration for the Dumbarton Pavilion came from the great 16th century Turkish architect Sinan, who designed all those mosques in Istanbul. It is interesting to note that both Johnson and Sinan lived well into their nineties. Amazing how so many creative artists (in several genres) are homosexual.